Peru is where the real adventure begins. We arrive in the capital city, Lima, on Halloween to kids making merry on the streets with sparkly bunny ears and bows. 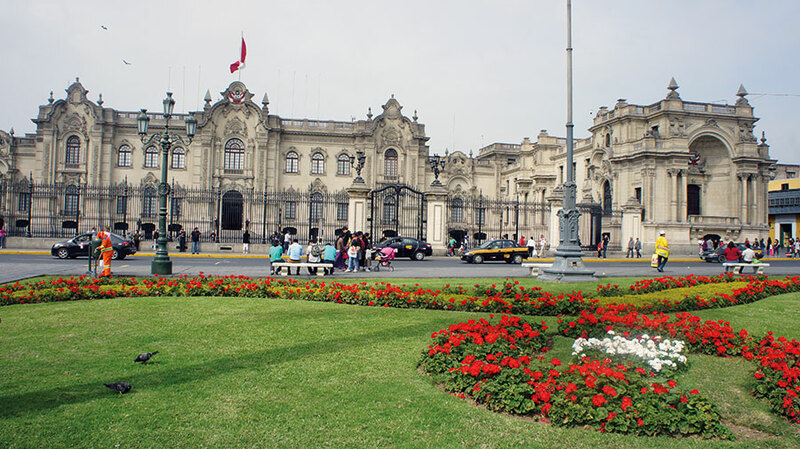 Lima is a city of beautiful old buildings with trellised balconies and large squares as we discover on a tour of the capital. From the beautiful Miraflores district where our hotel is located, we traverse the large Arequipa Avenue, the San Isidro district, the San Martin Square surrounded by exquisite white buildings and come to the main square the Plaza Mayor. 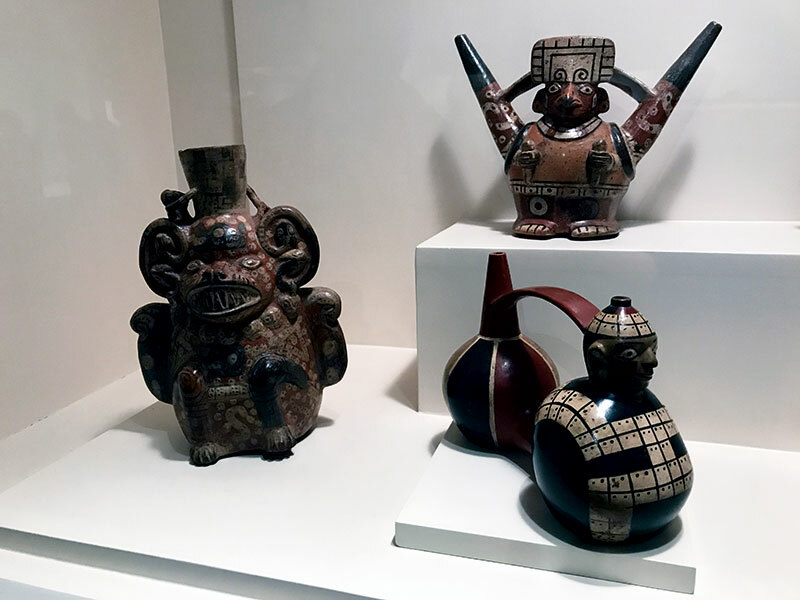 A visit to the San Francisco Monastery reveals its unique cloisters and catacombs, while a visit to the Larco Museum highlights the largest private collection of Pre-Columbian Peruvian art in the world. The following day, we fly to Cusco (11,000 feet above sea level), an Andean city that was once the capital of the Inca Empire, where we witness an El Pago a la Tierra or Mother Earth ceremony on a hillside under a thatched roof, performed by a local shaman who invokes Pachamama or Mother Earth’s blessings for good health and safe travels. Our drive through the Sacred Valley of the Andes now begins with the sky constantly changing colours and moods. 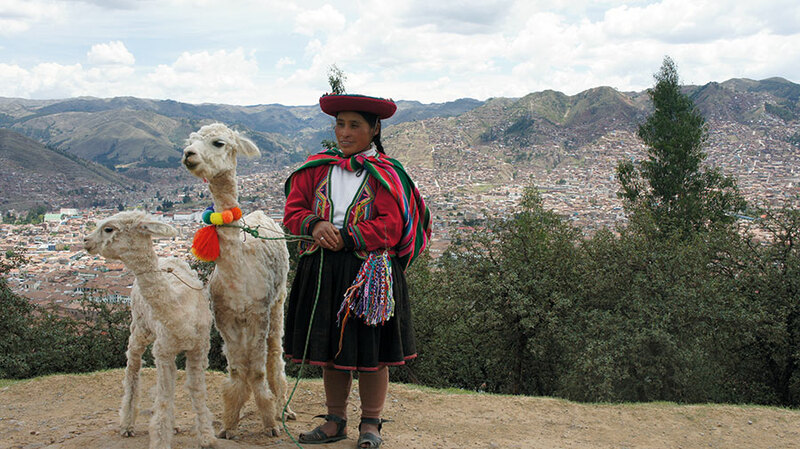 We stop at Pisac, a mountain village overshadowed by tall peaks, flaunting a market known for its silverware, alpaca sweaters and hand-painted dishes. Little girls in traditional dress carrying baby lambs or leading alpaca llamas call out to us to be photographed for a dollar. The drive continues with stops at vantage points. Stands of eucalyptus trees, rich green valleys, ancient terraces, swathes of cultivated corn and the Urubamba River form the backdrop for brick homes with tiled roofs. Our guide, Enrique, tells us the tale of these people, his people, and how they have embraced the Catholic religion while adhering to Inca customs. He, and eventually we, invoke the blessings of Pachamama for all the good things that we witness on this trip. Today, he tells us, is the day of the dead and we see, as we drive past, families outside graveyards, drinking and partying with their ancestors. In festive spirit, guinea pigs roasted on sticks are being sold at every corner. We are slowly drawing closer to the highlight of this tour — a visit to Machu Picchu or the Lost City of the Incas. In the shadow of this incredible site, however are others and we visit the Inca fortress, Ollantaytambo, a five-minute bus ride from the station of the Vistadome train to Machu Picchu that we now board. This takes us on the less-than-two-hour ride through the Urubamba Valley — a wild and rugged landscape. We pass some ancient sites and an Inca bridge. We see the beginning of the iconic Inca Trail, a hiking path up the mountain to Machu Picchu that takes three nights and four days and that can be as luxurious as you choose, with coolies, cooks and masseuses in tow. A local bus takes us up the mountain to the ancient ruins. 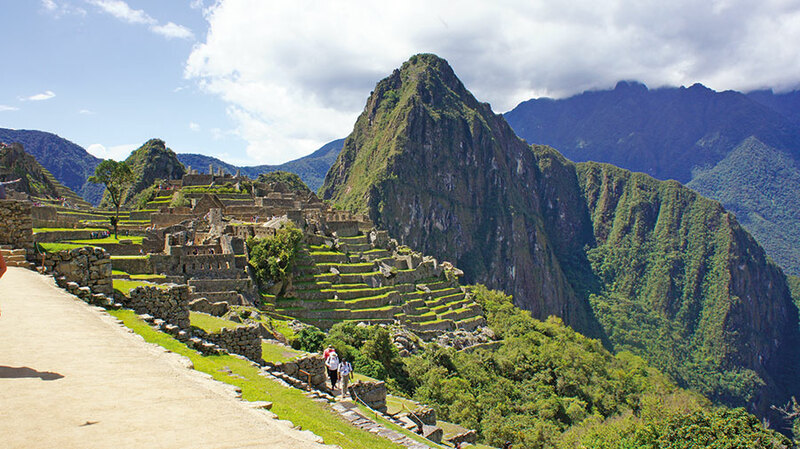 The first sight of Machu Picchu is unforgettable. The Inca terraces rise up in front of us and to the left-hand side. To the right, immense mountains sweep into deep valleys. It is spectacular! We walk through the ruins, marvelling at the immense knowledge of the Incas, their cleverness in creating the terraces that have withstood the ravages of time and the lashings of rain, at the temples built for Pachamama, to the Condor god, to wind and water. We climb to the ancient sundial at the top and review the exact positioning of the windows of the sun temple. And as we near the end of our walk around this mystic place, a rainbow forms in the valley as large drops of rain begin to splatter all around. Enrique tells us that he has grown up visiting this site since he was six years old, and no two visits have ever been the same. An early-morning visit here, the next day, reveals a fabulous sunrise. And then it is back onto the train to Ollantaytambo where our trusty buses are waiting to take us back to Cusco, where the next day reveals further Inca sites on a tour of the area. 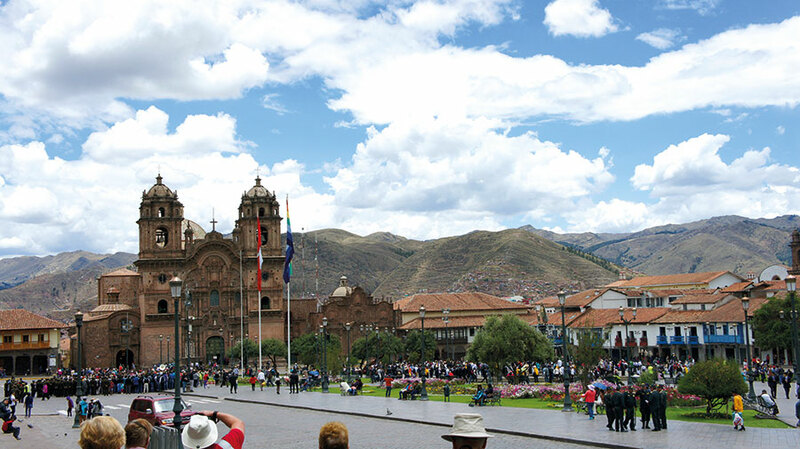 The central square of the old city, Plaza de Armas, a pedestrian-only area, beckons with its cathedral, church, old buildings with carved balconies, remnants of old Inca walls as well as a McDonald’s and KFC under the ancient arcades. 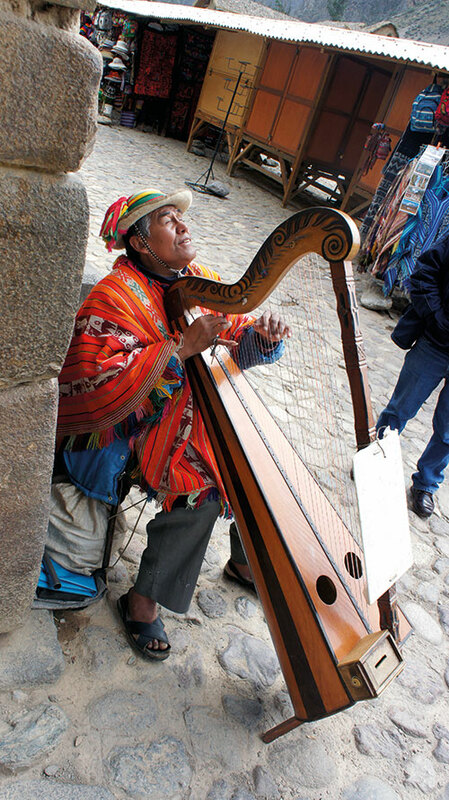 A band plays lustily as we traverse the cobbled square, a fitting farewell to this land of music, food and rugged beauty. Fond goodbyes…an exchange of email addresses, last-minute photographs, messages and the Abba song Fernando sung by an Australian lady in gratitude mark the end of our South American adventure as the group disperses and goes its many ways.